Miami-based Carnival began a five-year probationary period in 2017 as part of a $40 million penalty for one of their Princess ships illegally dumping oily water into the ocean, and then falsifying official logs in an attempt to hide the incident. In addition to these probation violations, Carnival tried to lobby the U.S. Coast Guard through back channels to alter the terms of the settlement. Carnival has acknowledged these incidents according to news reports. As a result, U.S. District Judge Patricia Seitz went so far as threatening to not allow Carnival to dock ships at U.S. ports. She will make her final decision in June about whether to impose a penalty on the corporation. Seitz described the 2017 $40 million settlement (the largest in ever for this sort of offense) as a “drop in the bucket” for a company like Carnival. So What Could Happen if Carnival Ships Are Blocked from U.S. Ports? Carnival Corporation owns more than 100 ships across nine cruise brands. Its lines, which either sail out of or visit U.S. ports include not only Carnival Cruises, but Holland America, Princess Cruises, Seabourn Cruise Line, and Cunard Line. 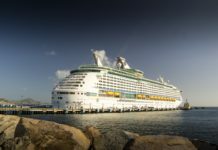 Obviously, if the cruise line cannot dock at U.S. ports, depending on the duration of the injunction, thousands of cruise passengers, and potentially hundreds of cruise itineraries could be affected. First, there is the question of passengers on the ship. Since cruise ships sail continuously, they are almost always fully loaded with passengers. That means if the cruise line’s ships are barred from docking in the United States, there will be tens of thousands of passengers who can’t easily get back home. Should that happen, we think the cruise line would look at ways to get people home from foreign ports. For example, disembarking passengers in Cozumel or Nassau and then paying to fly them home. (Even then, there is the issue of getting home passengers cruising with birth certificates instead of passports.) Obviously, this could be costly to the cruise line. And what about those cruises slated to embark in U.S. ports? Carnival currently has a wider range of U.S. homeports than any other cruise line. Carnival ships depart from Baltimore, Charleston, Ft. Lauderdale, Galveston, Honolulu, Jacksonville, Los Angeles, Miami, Mobile, New Orleans, New York, Norfolk, Port Canaveral, San Diego, San Francisco, Seattle, and Tampa. Since easy geographic access to its ships has been one of the company’s selling points, losing access to U.S. ports would have a severe negative impact on Carnival. What might the cruise line do? If prohibited from docking at U.S. ports, Carnival could opt to fly customers to the next nearest non-U.S. port on their itinerary. For example, New Orleans and Miami-based Western Caribbean cruises could sail out of Cozumel. Canada and New England cruises originally scheduled to depart from New York might begin in Halifax, possibly substituting Canadian ports for Boston and Portland. But the truth is that would be extremely expensive — and difficult logistically — for the cruise line. As well, many of Carnival Cruises’ itineraries can’t easily be shifted to avoid U.S. ports. For example, voyages departing from Seattle might visit one or two Canadian ports, but are primarily oriented toward Alaskan tourism. Hawaiian cruises would be unable to dock at any of the ports included in their itineraries. In addition to Carnival Corporation’s namesake brand, other cruise lines owned by the company will also be affected. Cunard, Holland America, Princess and Seabourn might have to cancel some U.S.-focused itineraries and find substitute ports outside the U.S. in order to salvage voyages. Should Passengers Be Worried? What Should They Do? Given the disruption the Carnival’s business, it’s likely the company will do whatever it takes to ensure they continue to sail from U.S. ports of call without interruption. Still, the potential threat has many people worried. Checking Carnival’s Twitter feed, the cruise line’s social media team was fielding comments and concerns by reiterating the company’s commitment to environmental concerns and assuring them there are no changes to schedules right now. Our environmental responsibility has been and continues to be a top priority for our company. We intend to fully address the issues raised before the court that has received some attention. We want to assure you there are no changes to any cruise itineraries or schedules. All that said, if you have an upcoming cruise with Carnival, it wouldn’t be a bad idea to get some cruise insurance to give you piece of mind. We agree that travel insurance may be your best protection if you’ve already booked a an upcoming cruise on any of the brands owned by Carnival for any time around June. Again, a disruption may not happen, but it never hurts to be better safe than sorry. For more detail on cruise insurance, you can read our guide here. I already have a cruise scheduled with Carnival Cruise non Nov. 9th to leave out of Jacksonville FL. would I just be able to cancel it? If the ships are banned? You’d have to see. In our opinion, a banning is unlikely. Even if it did happen, it would likely be cleared up by November.